“Invest in a morning to explore the WHAT, WHY and HOW of creating a business that truly matters." 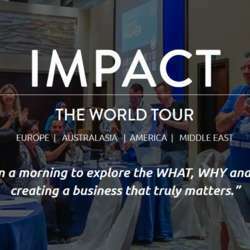 Registration for IMPACT The World Tour, you will get $50 off each ticket if you sign before Friday. Please register TODAY to claim your seat and invest in a morning to explore the WHAT, WHY and HOW of creating a business that truly matters. "At last, we’re bringing an extraordinary event to the United States. It’s the most impactful thing I’ve ever done. And I’d love it if you, your team and your clients can be there with us. B1G1 becomes 12 years old in Protected content . So many wonderful businesses have joined us along the way and together we’ve created over Protected content giving impacts together so far - which is astonishing. And yet there is so much more we can be doing to really create an even greater legacy and impact on our world. So, to celebrate some great milestones and some great things coming in B1G1, we are bringing you an experience that you will always remember. The main part (the full morning) of the event is open to public: everyone who wants to see how they can create an impactful, sustainable and fully connected business will learn so much and enjoy outstanding networking opportunities too. It’s packed with inspiration, profound insights and tangible, impactful ideas. You’d also want to bring your clients (they will absolutely LOVE it) and one or two of your team members to this event to share in the experience. We strongly encourage you to register now and get your ticket at this special rate (you’ll save $50 per ticket). And we also look forward to connecting with your friends and sharing critical insights that will profoundly impact their businesses too. Wishing you a great week ahead as well.